Why do global brands like 3M, GlaxoSmithKline, HSBC, HP, Microsoft and Vodafone—AND thousands of digital marketers and business owners—use Smart Insights Expert Membership to optimise their digital marketing? Because many have grown their business—by over 50%—using the strategies revealed on this page. 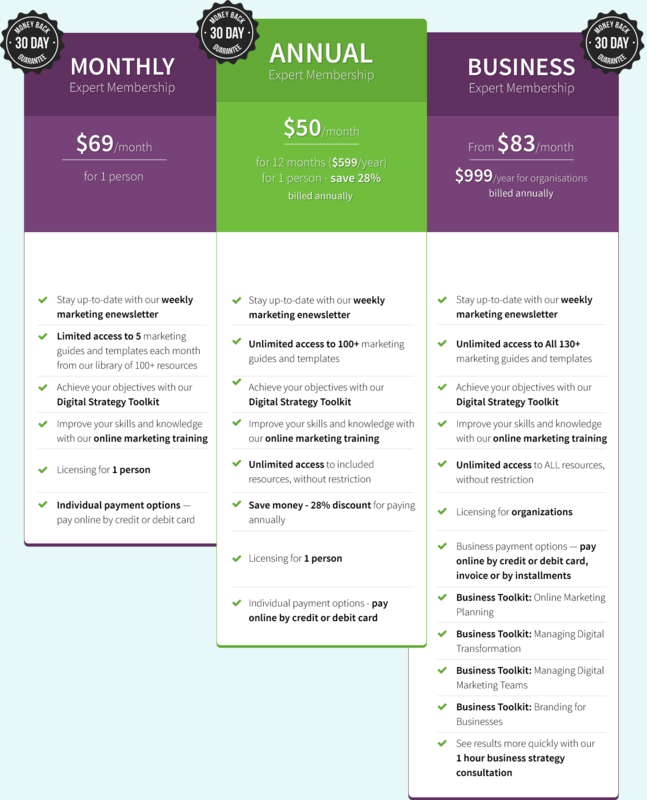 Smart Insights Expert Membership is the secret weapon behind the world's most savvy marketers, and now it's available for everyone. 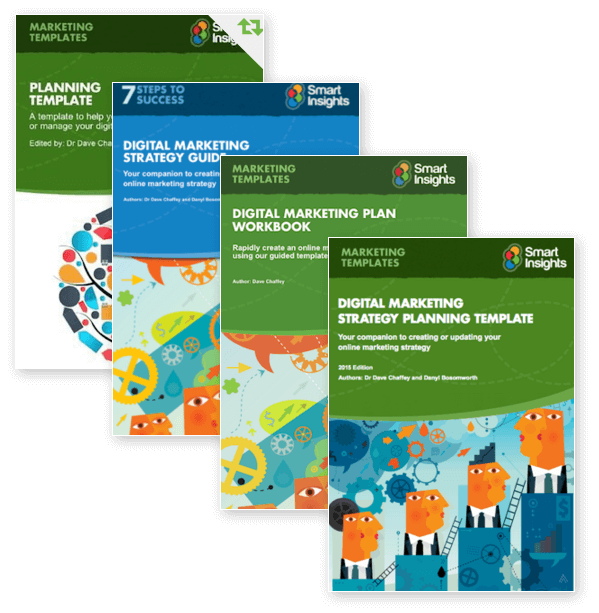 Whether you want to drive more traffic to your site from Facebook, improve conversion on mobile, develop a winning email marketing campaign—or any other digital marketing problem—you’ll find a step-by-step roadmap to success in our Digital Strategy Toolkits. Our 140+ Expert Marketing Guides and Templates show newbies how to cheat the learning curve, and seasoned marketers how to get ahead of the game. 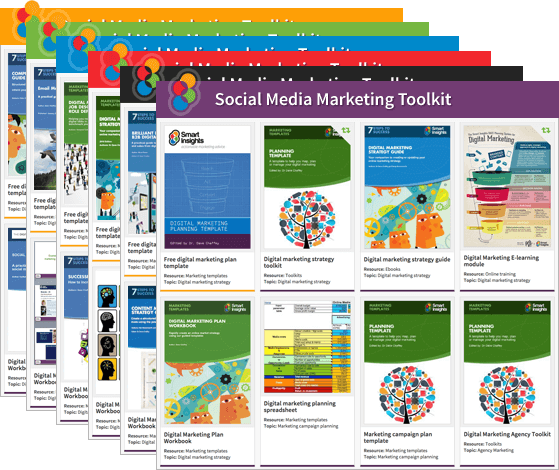 Our Digital Cheatsheet is a one-stop-shop to keep you state of the art in all things digital marketing, so you can speak confidently to your peers, and get buy-in and investment from colleagues. Grow yourself professionally and earn more money—successful digital marketing experts are hugely valuable—with our Expert Online Training Courses and Qualifications. Thousands of digital marketers, consultants and businesses owners are using Smart Insights Expert Membership to plan, manage and optimise their marketing. Many have reported wins in excess of 50%. That’s no accident — it’s a proven system that you can use on your business or clients today. And the cost? From just $50 a month. Digital marketing experts are expensive. If you wanted to hire the members of the Smart Insights team for one day, it would cost you $41,540 (though many of our team members no longer take on client projects). Fortunately, for you, we’ve distilled their knowledge and packaged it into 140+ practical, actionable resources that can be used on your projects today—that's $41,540 worth of consulting talent at your disposal for as little as $1.64 a day! 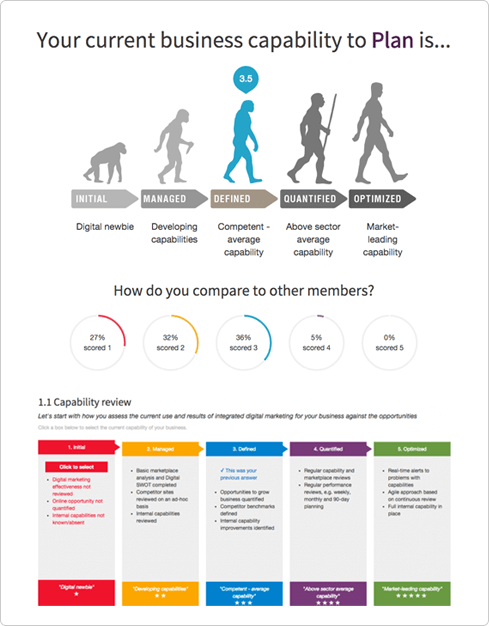 Assess the current digital marketing capability of your business or your clients. Follow our step-by-step guide to rapidly create an integrated digital strategy—your roadmap to success. Prioritise your investments in digital marketing to maximise returns. Discover how to implement your roadmap successfully, and transform your business. A robust digital marketing plan is vital, but tough—how do you know where to start? That’s where our Interactive Benchmarking Tool comes in. It’s easy, fast and gives you everything you need to take action right away. Find out exactly where to start with digital marketing, based on real data about your business. It seamlessly integrates with our planning templates, so you can be sure you’re building a digital strategy based on rock-solid data—you’ll be focused on the critical few activities that will drive the biggest results. Plus, every recommendation will be linked to the corresponding resource from our library, so you can literally get started right away. 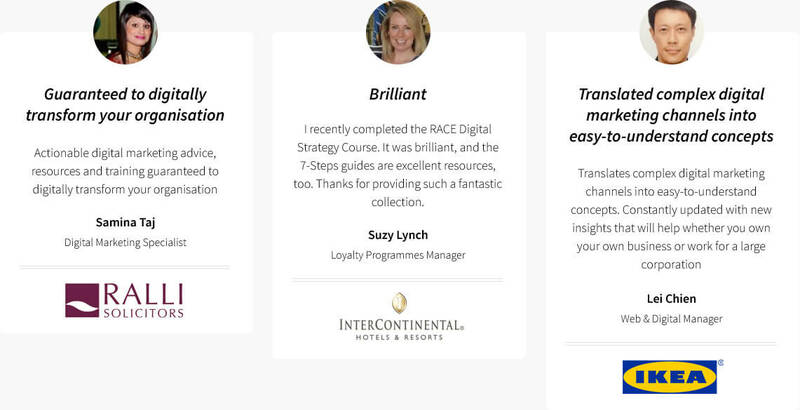 And if you’re not sure you have the skills in a particular area, the tool even integrates with our Digital e-Learning Module—you’ll have everything you need to take your results into orbit! 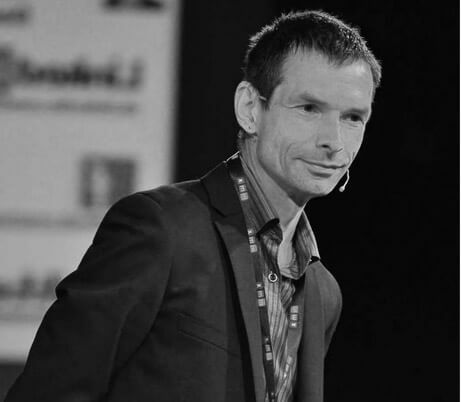 Looking to develop a wider, deeper knowledge of digital marketing? 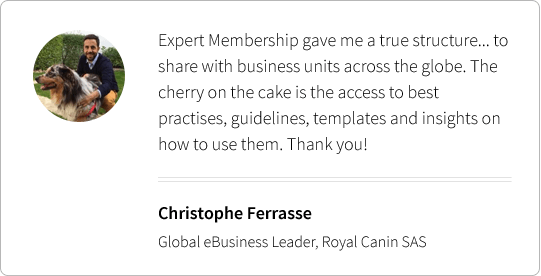 Need to create a digital plan for your company or clients? If so, this unique e-Learning course is designed for you. Focusing on the 25 key digital activities that you need to be doing, we'll show you how to create a tailored digital roadmap to success. 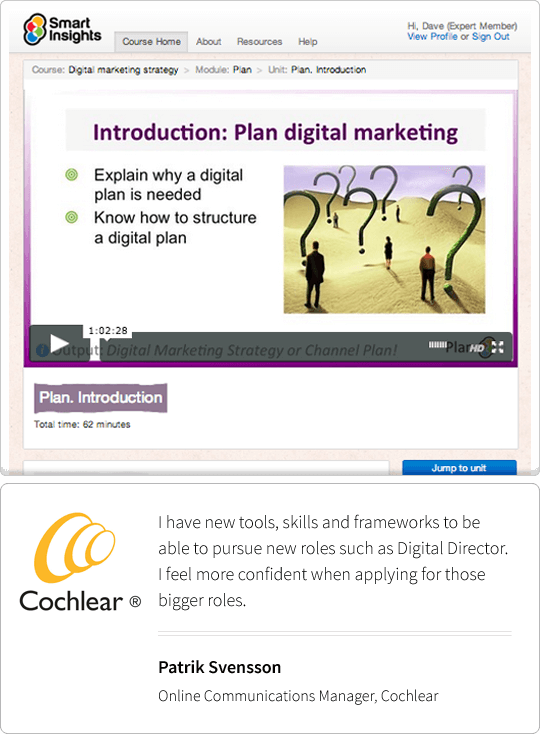 Unlike many courses for digital marketing, which can be academic, superficial or not that actionable, ours is super-practical. As you complete each topic, you will create a Digital Strategy Plan for your business or your clients. PLUS, access to over 140 exclusive resources packed with practical and actionable advice, guidance, step-by-step instructions and best practice that you can use to start growing your business—or your client's business—TODAY! Got a problem? Get practical, actionable advice on every aspect of digital marketing and beyond from Smart Insights' team of world-class experts. Increase your ROI from mobile. Benchmark your business—or your client's business—against competitors. 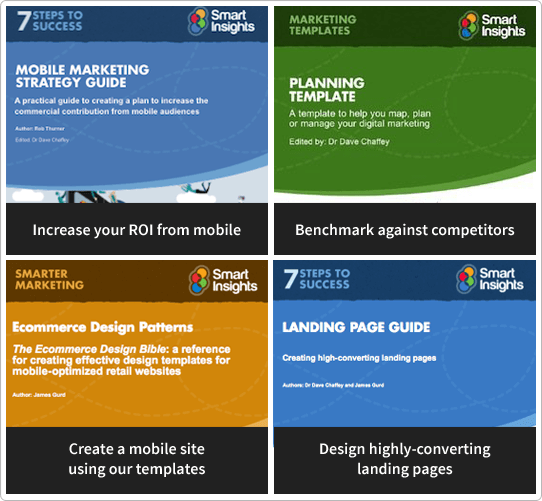 Create an optimised mobile site using our templates. Design highly converting landing pages. Create customer personas and optimised content. Increase email open rates with optimised subject lines. Make the case for more investment in digital marketing. But don't delay—as you read this the Smart Insights team are working like crazy making new templates, guides, resources, toolkits, and videos for Expert Members. Today's prices can't last. Our world-beating library of 140+ resources is increasing in value every day, so hurry and guarantee these amazing prices before it's too late. Choose a Plan Now and Secure Your Digital Marketing Success!